Allergies are triggered by a variety of things that don't bother most of the population -- pet dander, dust mites, mold, insect stings and certain foods. However, it's also possible to have an allergy to UV light -- a sun allergy. Like more common allergies, allergy to the sun's ultraviolet rays is tied to a faulty immune system. Bumps, hives, blisters and blotchy red patches on your skin are symptoms of an allergy to UV light, also known as photosensitivity. Researchers still don't know exactly how sunlight causes changes in the skin of photosensitive individuals; however, just as the immune system perceives proteins in pet dander or dust mites as a threat to the rest of the body, it responds to sunlight in a similar manner, and an allergic reaction subsequently takes place. Exposure to UV rays triggers an inflammatory response in the skin. Sun allergies can be triggered after only a few minutes of exposure to the sun's UV rays. It's not known why some people develop a sun allergy and others don't; however, some types of photosensitivity may be inherited. There's more than one type of sun allergy, each which might affect you in different ways. Symptoms of polymorphic light eruption, also known as PMLE or sun poisoning, start between minutes to hours of exposure to the sun and are generally characterized by small, itchy white or yellowish bumps or flat bumps. This type of sun allergy is most common and is typically seasonal, occurring in spring and early summer. Actinic prurigo is more severe. This type of sun allergy can form fluid-filled bumps that crack, split and scar, and may affect the lips, cheeks, necks, ears, arms and hands. The symptoms of chronic actinic dermatitis, another type of sun allergy, are similar to those caused by contact dermatitis: dry, itchy, red skin that occurs in patches on the face, head, back, neck, chest, arms and hands. Solar urticaria results in itchy, raised bumps called hives, says Harvard Medical School. Solar urticaria is less common than other types of sun allergy. Symptoms arise within minutes of sun exposure and can affect skin sheltered by clothing. The treatment for sun allergy largely depends on the type. 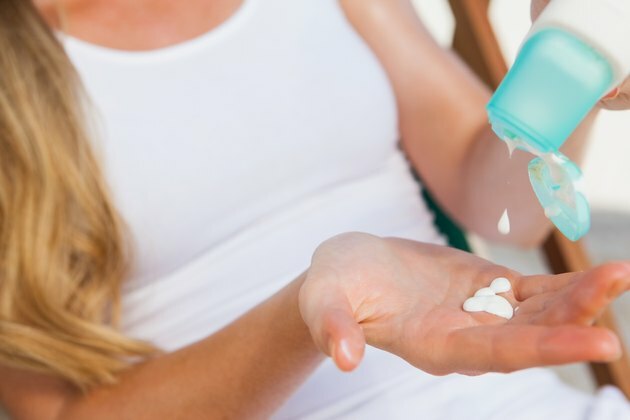 Treatments for sun allergy may include oral antihistamines, prescription and nonprescription corticosteroid creams, oral corticosteroids and other medications. Special clinics may offer a treatment called phototherapy, in which patients receive controlled UV exposure around three times weekly for several weeks, generally in the springtime. This acclimates the skin to UV light, making symptoms less severe when it's exposed to natural sunlight. Simple lifestyle adjustments can prevent sun allergy. Staying out of the sun between the hours of 10 a.m. and 3 p.m., when UV rays peak, may reduce risk of sun allery. If you go outdoors, wear a broad-spectrum sunscreen with a sun protection factor, or SPF, of at least 15 – when choosing a sunblock for your lips, seek a product with an SPF of 20 or more. Wear clothing that covers your skin, such as long pants and shirts with long sleeves -- UV light allergy increases risk of skin cancer. Keep in mind that some medications can cause photosensitivity, such as antibiotics, birth control pills and drugs for high blood pressure and heart failure. If you're placed on a new prescription medication, ask your treating physician if you need to take precautions when going out in the sun. If you experience unrelenting symptoms that suggest you have an allergy to UV light, schedule an appointment with your doctor. Often, a diagnosis can be obtained through your medical history and examination of the troubled skin. However, in some cases, other diagnostic testing may be necessary, such as UV light or photopatch testing, blood testing and skin sampling.